Appointed in 2015, Lilly Lewarne Architects worked closely with All Saints Church, Highertown to design and realize their vision of a purpose built community hub supporting the currently popular Church complex in Highertown, Truro, successfully obtaining a planning consent in December 2018. We encourage all to get involved in this community project and are glad to be a part of it. 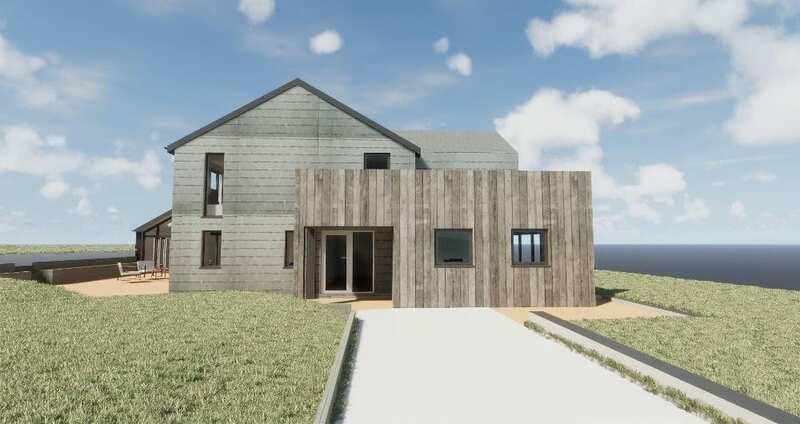 Lilly Lewarne Architects are pleased to announce that we have gained planning consent for a contemporary new home in Scarcewater Vean, St Clement, Truro. Introducing a mixed pallet of materials that will weather over time, the new home responds positively to the site’s special natural character, enhancing the architectural style of the area. Lilly Lewarne are delighted to announce that we have obtained planning consent for a New Community Centre and Band Rooms in Methleigh Bottoms, Porthleven. Taking full advantage of the open views to the South, this new development creates much needed practice and performance spaces to accommodate Porthleven Town Band. The new building will also provide new community use facilities for the people of Porthleven. Lilly Lewarne are delighted to have obtained planning permission for the redevelopment of a post industrial site on the outskirts of Devoran, to create a terrace of 4 luxury homes with magnificent views over Devoran creek. Lilly Lewarne are pleased to announce that we have gained planning consent for three new dwellings in the small hamlet of Trenance, near St. Issey, Wadebridge. After a lengthy planning process and a change in planning policy with the new Cornwall Local plan three new dwellings in this area of the hamlet became a real possibility. The houses are traditional in feature, using local stone facing and slate roofs each with their own gardens and parking. The main aim of the client was to re-use an old unused site for the benefit of the area by creating houses for local people. Lilly Lewarne Architects are pleased to have recently obtained outline planning permission for a sensitive residential development of 4 dormer bungalows on the edge of Perranwell Station. Following a collaborative period of negotiations with Cornwall Council and careful assemblage of investigative reports, with the support of the Parish Council permission was granted for the proposals. Lilly Lewarne Architects Chartered Architects Truro are delighted to announce the successful outcome of an appeal to the Secretary of State for Cornwall Council’s refusal of a householder planning application for the extension and alterations to an existing dwelling at Higher Rosevine on the Roseland Peninsular, Cornwall. We wish our client every success in their future development of their project. Ten years on we are now looking to go even further with Phase 2. The scheme will provide 17 new family homes built to the Passivhaus standard to hopefully achieve over 80% lower heating bills (over a standard build), potentially even higher reductions in carbon emissions and outstanding indoor comfort all year round. Construction is due to commence early 2016.